#01, from the series, Atomic Overlook. © Clay Lipsky. Sarah Jamison: First off, what initially drew you to photography, and who do you count among your influences? Clay Lipsky: From a young age I had an interest in photography, but initially discounted it to pursue other interests such as film and graphic design. Coming back to it later in life, I enjoy the escape photography offers. Looking through the lens is much like looking into another dimension for me. It is a medium that offers so much diversity in terms of style and expression and has enabled a wealth of artistic growth. My photographic influences range from classic black and white street photography to experimental artists like Man Ray and Philippe Halsman, to more contemporary ones such as Andreas Gursky and ParkeHarrison. 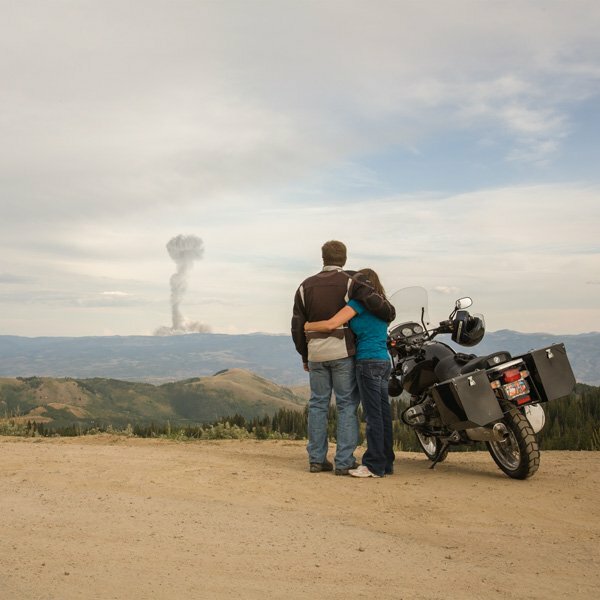 #06, from the series, Atomic Overlook © Clay Lipsky. 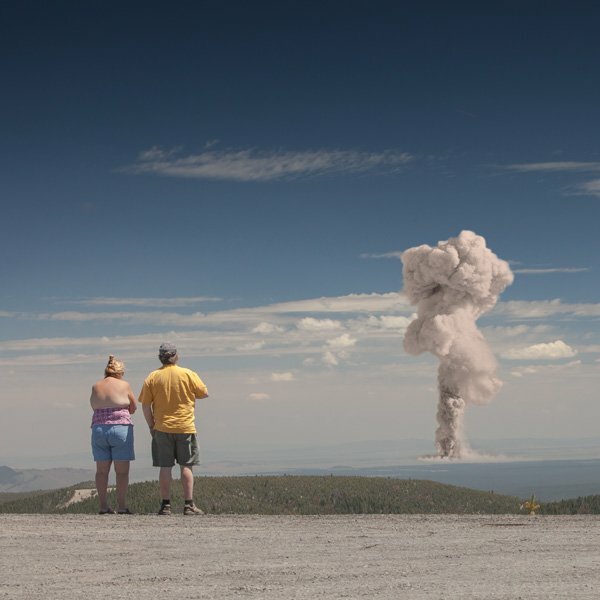 SJ: In your series, Atomic Overlook, you combine images of voyeuristic tourists and the atomic bomb mushroom cloud. Please describe the creative process of constructing these images, and why you choose the images that you do. CL: Atomic Overlook was a series that came about very organically. 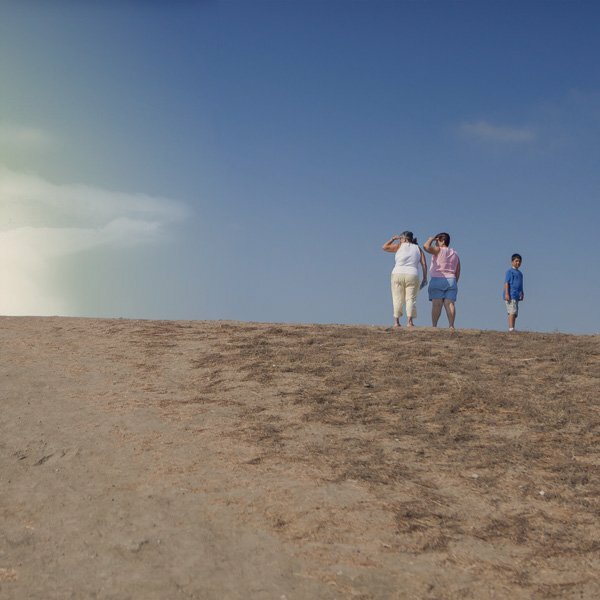 Over the course of many years I amassed a collection of images with people gazing into bleak landscapes. For me, this initial series spoke about tourism, voyeurism and our physical insignificance versus the natural world. But as time moved on I eventually wanted to say more through it. Combine that with a desire to try my hand at photo-montage and an opportunity was born. Having grown up in the Cold War, I was always fascinated by the atomic bomb as the ultimate doomsday device. I was mesmerized by the atomic test of the 1950’s where mock homes were destroyed and soldiers would watch the blasts wearing nothing but sunglasses. Once I conceptualized the mixing of these inspirations, other deeper meanings for the series began to appear. #03, from the series, Atomic Overlook. © Clay Lipsky. SJ: This series has grown from your image collection, which spans over 10 years. As we advance into the technical age, the amount of images in one’s personal archive today has many artists recycling and re-contextualizing their images. How does this process hold significance for you? What are your thoughts on the changing ways images are viewed in our society? CL: Having a personal image archive has helped me understand my own vision and voice better. I can recognize recurring themes in my work and also build upon previous photographic endeavors. I think Atomic Overlook is better because it was initially a “re-mix” from a previous body of work and became a culmination of ideas/efforts. It is an amazing time for visual media in our society. Photography and video are the new currency. I think this proliferation will create a more visually savvy audience, hungry for new means of expression and a broader visual dialogue. #04, from the series, Atomic Overlook. © Clay Lipsky. SJ: Today, we share images through almost every media outlet available to us. They are powerful tools, which allows us to connect with each other. What are your thoughts on how the mass amount of images available today has changed the way our culture understands our history? CL: The explosion of digital media has definitely ushered in a new era for the historical record. Significant events can now be seen from various vantage points and ideally new truths will be revealed. The problem arises with how images can be misunderstood or misused (i.e. propaganda). Media pushes the image first and the story second and often the latter may never be told. #13, from the series, Atomic Overlook. © Clay Lipsky. SJ: Every culture has their version of the apocalypse. 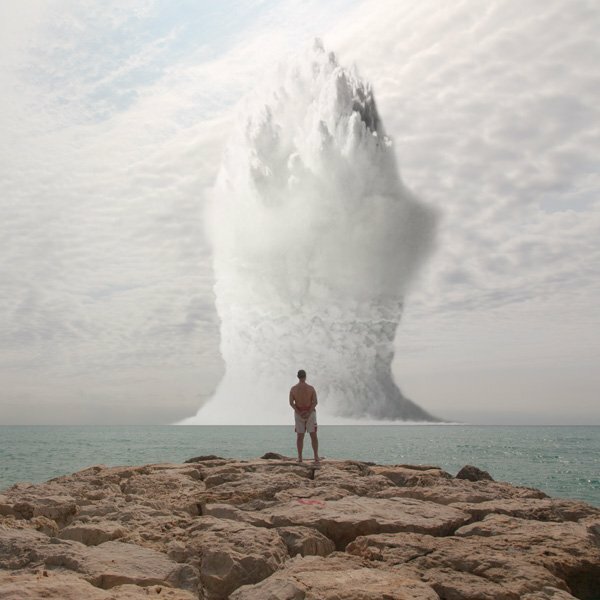 The mushroom cloud in particular is easily associated with the contemporary doomsday scenario. How do you feel your images utilize this iconography to address our post-atomic culture? 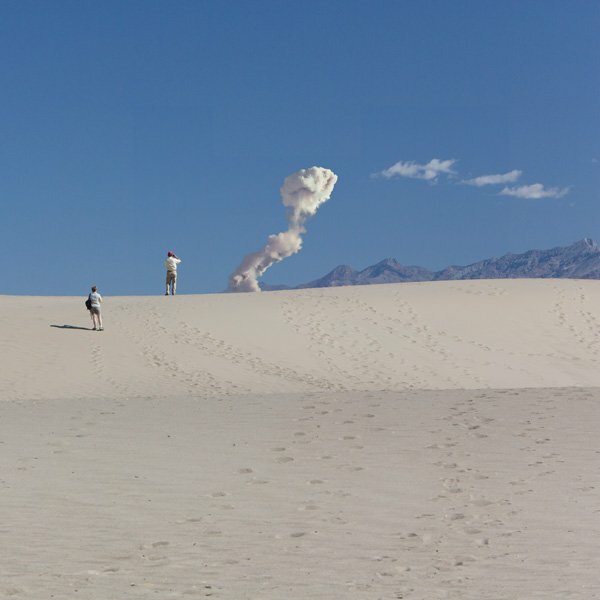 CL: The mushroom cloud seems to be one of the most universally recognized symbols. Few have seen one yet it is burned into our collective subconscious. The nuclear threat is still real and pressing but as time moves on it is out of sight and out of mind. 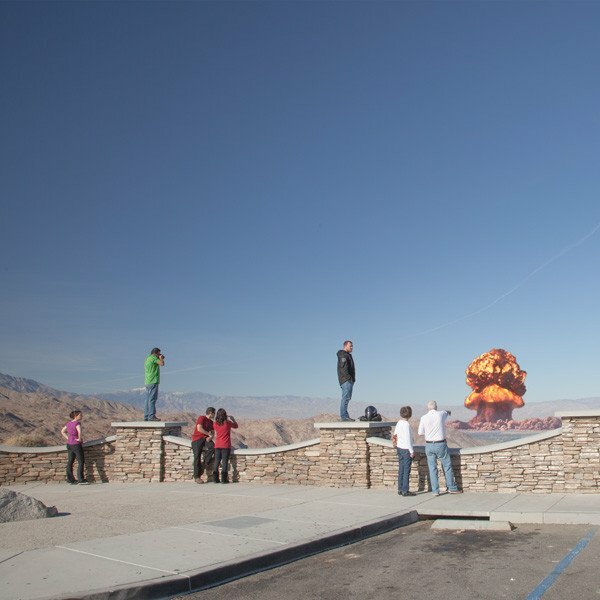 The re-contextualizing of the historical record in Atomic Overlook is an attempt to contemporize the threat, remind us of the futility and hopefully help the viewer project themselves into the bigger situation. Sadly, much like the nuclear diplomacy that keeps the world at bay, it’s a situation where we can do little but stand by and watch. #11, from the series, Atomic Overlook. © Clay Lipsky. SJ: Your images have a very cinematic quality to them. You mention in your artist statement that as a child, the depictions of the atomic bomb “both intrigued and scared” you. 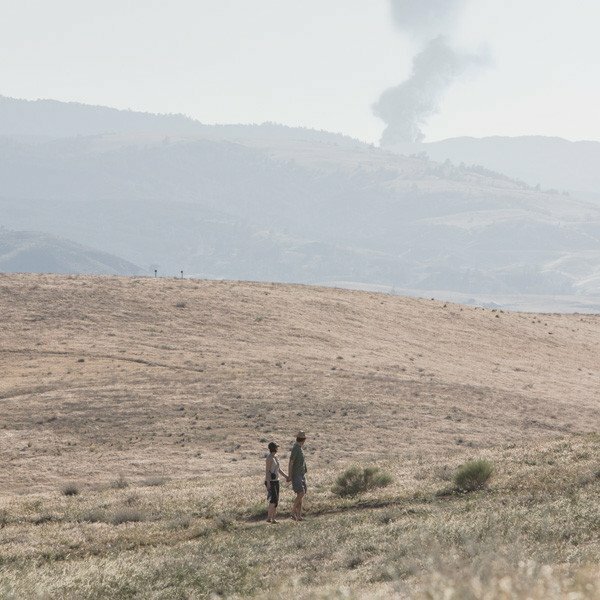 Comparing your early experiences to atomic explosions in modern movies, how do you think the continued presence of the mushroom cloud in the media has affected your work? CL: Compared to growing up in the Cold War where the threat seemed more imminent, the continued use of the mushroom cloud has become more metaphoric to me. It’s the cinematic exclamation point that still gets the message across. For me in this series, I was really thinking beyond its physical form to how routine the concept of doomsday has become. The “end” could be anything from nuclear fallout, to global warming or an asteroid, it’s all relative. 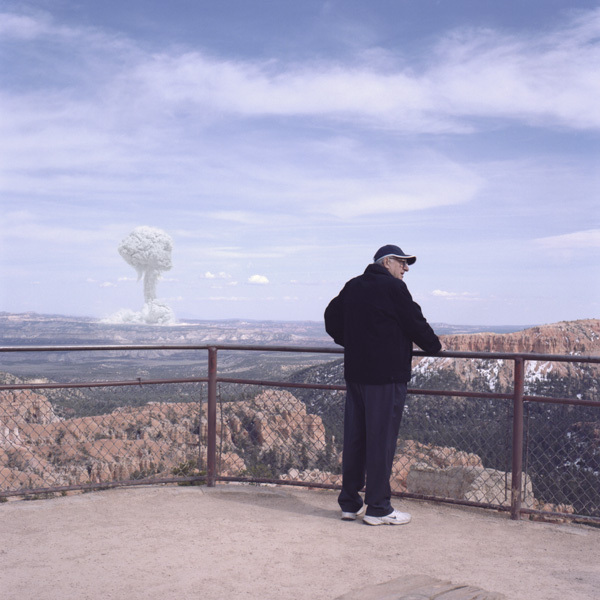 #07, from the series, Atomic Overlook. © Clay Lipsky. SJ: As a follow up, what are your thoughts on how images can desensitize a society to a devastating event? Do you believe that in working with your images, you have become desensitized? CL: These days I think it’s hard to not be somewhat desensitized to devastating events. The media cycle is a viciously repetitive beast and we are exposed to more global events (and tragedies) than ever before. I definitely feel distanced from the catastrophes play out in the media, but in life and in my photography I always try to stay open and vulnerable to my surroundings. #8, from the series, Atomic Overlook. © Clay Lipsky. SJ: Last but not least, what are you looking forward to in the next year, photographically or otherwise? CL: I have spent this last year supporting my existing bodies of work through shows and publications so I look forward to getting back to shooting and finding out what’s next creatively. Self publishing has always been an interest of mine and I may create book projects as a way of slowing down and developing more long-term goals. Having a relaxing tropical vacation is always on the to do list, but I think I am happiest when on the go with camera in hand. #02, from the series, Atomic Overlook. © Clay Lipsky. Clay Lipsky is a fine art photographer and Emmy award winning graphic designer based in Los Angeles. His photos have been exhibited in various shows including those at the Annenberg Space for Photography, MOPLA and The Impossible Project Spaces in NYC & Warsaw, Poland. Clay has also been published internationally in print and online, most notably with Esquire Russia, Wired Italia, Libération (France), Yahoo! Germany, Fraction, Square, Diffusion, PH and Shots Magazines.